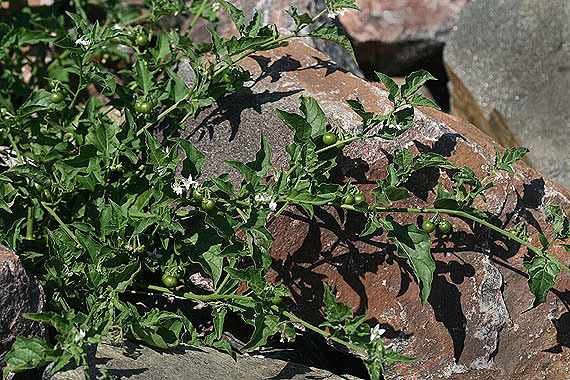 Solanum americanum is a white-flowered Nightshade that grows as a weed in disturbed areas on the plains. Leaves are wavy margined or shallowly lobed. In fruit, the calyx is reflexed and does not cover the berry. The flowers of Solanum spp. arise from the stem in the middle of the internode, which is an unusual characteristic. All Solanum spp. in eastern Colorado are introduced species. 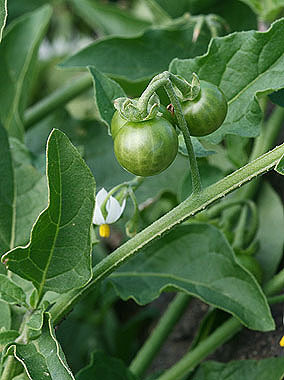 Compare to Solanum physalifolium, which has pubescent stems and leaves and a calyx which covers the base of the fruit. 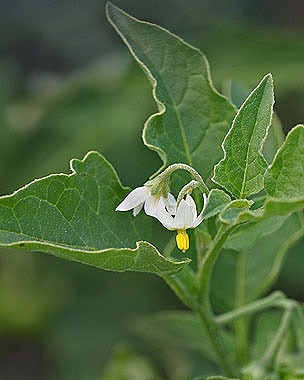 Compare to Solanum triflorum, which is also white-flowered but has deeply lobed leaves.